For most of a decade, the defensive line has been the Nebraska football program’s major on-field weakness. Those of us who saw Rich Glover, Larry Jacobson and Broderick Thomas terrorize opponents during the Devaney-Osborne era still have trouble coming to terms with that. Like a persistent cancer, perpetual unsoundness in the trenches has plagued the Huskers ever since Ndamukong Suh and Jared Crick left Lincoln for the NFL. Maliek Collins and Vincent Valentine flashed enough talent to be disruptive on occasion, but could not prevent all-too-frequent defensive cave-ins. Those collapses came under both Bo Pelini and Mike Riley, and they happened far too often in Scott Frost’s first season. 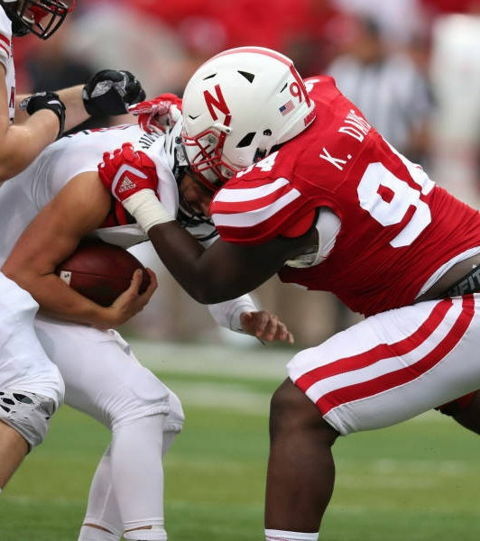 Injuries, lack of development, and flat-out recruiting ineptitude have bitten the Cornhuskers hard in the d-line, which has been chronically thin. That was never more apparent than in 2012, when Baker Steinkuhler held the defensive front together throughout the six-game run that brought their only Big Ten Championship appearance, but his untimely knee injury — possibly the Huskers’ costliest injury since the turn of the 21st century — exposed the problem in a blowout loss to Wisconsin. Khalil Davis makes a stop. News from spring practice makes it evident that Frost and his staff are making this problem area a focal point. Can the d-line go from a major weakness to a strength of the team in just one season? Tony Tuioti, the new position coach, is being asked to make that leap. I like what I’ve seen of Tuioti so far, but there’s a lot of proving to be done. With explosive sophomore quarterback Adrian Martinez, Nebraska is on the verge of creating an offensive powerhouse, but even with Frost, a recognized offensive wizard, at the controls, pinning all your hopes on an explosive offense is not sustainable. This is not the American Athletic Conference. In the Big Ten, hanging your hat on outscoring your opponent 56-49 makes sense in basketball, but not in football. First and foremost, this fall, Nebraska’s d-line has to step up to the level of the Hawkeyes and Badgers. The Cornhuskers have a top-shelf quarterback. That’s vital, but that’s been only the No. 2 problem with Husker football since they joined the Big Ten. Adrian Martinez is a legitimate all-conference candidate, but after Martinez, the Davis brothers and the Daniels brothers will influence Nebraska’s success more than anyone else in 2019. Throw in Ben Stille and possibly Daishon Neal, and you have the most important core group on the team. I like the Huskers’ new philosophy of substituting entire lines on occasion to keep fresh bodies in the game. I like Tuioti’s idea of having eight dependable interior linemen. That sounds like a distant dream for Blackshirt lovers everywhere, requiring a minimum of two newcomers becoming battle-ready by the end of August. Husker fans starved for dominant defensive line play are suckers for springtime feel-good stories, which are being served up hot and juicy these days. But then again, good publicity almost always precedes successful seasons. Inexperience will not be a major issue this fall. Carlos and Khalil Davis are seniors, and are in their second year in the same scheme. That should pay off in a big way, especially with the addition of senior transfer Darion Daniels who, by multiple accounts, is providing strong verbal leadership in his first few weeks on campus. Strong leadership from interior linemen is a good sign indeed. Darion’s brother, sophomore Damion Daniels, has the highest ceiling of anyone on the Husker defensive line. If it’s true that a run-stuffing nose tackle who can control both A gaps is the key to Erik Chinander’s defense, he could be the ultimate “War Daddy,” but only if he can build enough endurance to play effectively for more than a few snaps at a time. Stille has shown the ability to create havoc, but not often enough. He seems ready to take a major step forward as a junior. Neal has had a quiet six tackles throughout his career, and has never been a disruptive force. Will he finally make some noise in his senior year? There’s no way to get any certainty how much progress is being made until they suit up this fall. But it appears the Huskers finally will have enough depth to overcome at least one or two major injuries. Nebraska will be more than adequate at the skill positions, with at least enough talent to win the Big Ten West. The question is whether the men in the trenches — especially on defense — will be up to the task.